Southern California Lake Fishing Maps, Report, plus Public Land Hunting, Clubs, and Ranches The map to this area is under construction, but here you get access to our giant free hunting and fishing Map site, with how to fish and where to fish or hunt these Public lands. 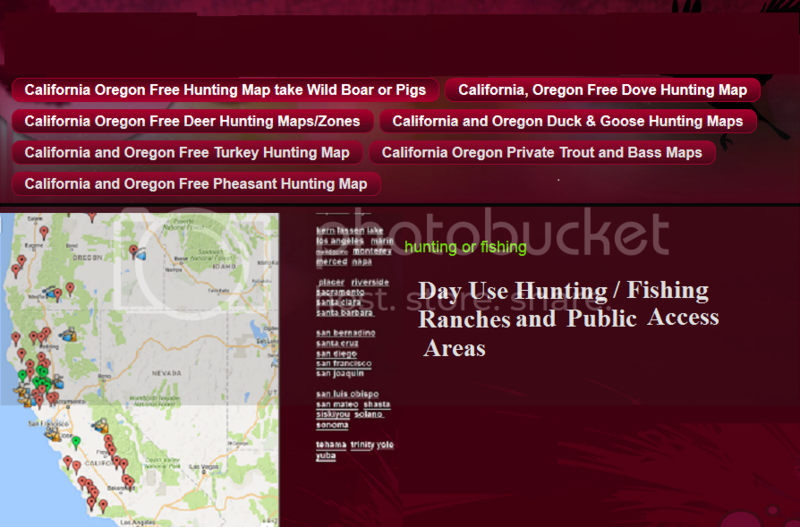 Get access to Hunting Clubs and Private ranches for fishing and hunting. Always free with no strings attached to help preserve our Outdoor Heritage. Lake Piru in Ventura County has bass, trout, catfish, bluegill and crappie The lake has plenty of structure where bass like to hang out. Summer is slower so the spring months through May is the most productive. Use our fishing maps to see Reasoner Cove, Diablo Cove, Cow Cove, and Santa Felicia Cove. For trout during the winter see the fishing map for where the lake narrows, and in warmer month for trout you need to fish the dam area. Trolling is your best bet at this time of year to 40 to 60 feet.